This action-packed anime centers around a five-member team of super powered teen-aged ninjas who battle the evil Galactor, an international terrorist organization of technologically advanced aliens trying to seize control of Earth's natural resources.The Galactor are led by Bergu Kattse, a wily androgynous masked antagonist who acts on the behalf of the mysterious alien presence, Sosai X. Most of their plots involve the use of huge mecha that are modeled after animals or monsters that are used to steal or control various natural resources. 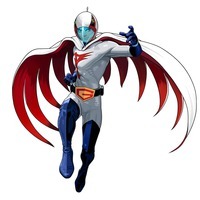 The Science Ninja Team Gatchaman, under the guidance of their founder and leader, Doctor Kōzaburō Nambu of the International Science Organization, must guard the Earth against these foes. Most of the team is in their late teens, apart from Jinpei who is about ten or eleven. They include Ken Washio, the team leader and tactical expert; Jō Asakura, his second-in-command marksman and weapons expert; Jun, the team's electronics and demolitions expert; Jinpei, the youngest and reconnaissance expert, and adopted brother of Jun; and Ryū Nakanishi, the ship's pilot. 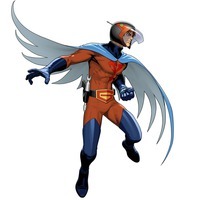 To change into superheroes, each member is equipped with a special wrist device that, aside from being a communicator and tracking device, enabled the change when the proper gesture and voice command "Bird, Go!" was given. This changed them into their costumes and actvated their powers. 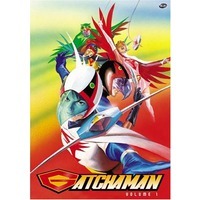 The Gatchaman team used a unique style of very violent and highly effective martial arts, developed by Dr. Nambu, that drew from their physical abilities to enable them to perform superhuman feats, akin to their avian namesakes, such as high-speed run and flight, high jumping, silent movement-attack and the like. This fighting system was known as "Science Ninja Technique" (科学忍法 Kagaku Ninpō? 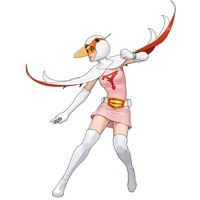 ), and it is mentioned in the original Japanese lyrics of the Gatchaman theme song. The team members also used various signature weapons and mecha-style vehicles; each had a more mundane-looking disguised form. Their vehicles were docked in the team's main vehicle, the God Phoenix, a supersonic plane and submarine capable short-range space flight as necessary. The God Phoenix was armed with an unspecified but large (roughly 30+) number of Bird Missiles that were fired from a rack system mounted atop the center section. After the original God Phoenix was destroyed by an octopus-based mecha, an improved version carried a pair of Super Bird Missiles in twin drop-down pods from the bottom center section, which could be fitted with either a warhead for attack or a manned capsule to carry a passenger for a boarding operation when it successfully impacted into an enemy vessel. The ship also could have an energy-beam weapon that was deployed by sliding, which opened the nose doors for the weapon apparatus that was mounted on the same frame holding Joe's car, but its solar power source was unreliable because of its sensitivity to any interfering cloud cover. In addition, when necessary, the plane was able to temporarily transform into a massive bird of flame like the legendary Phoenix to escape danger or as a powerful attack, although the process itself endangered the team because of the extreme pressure felt in the passenger cabin.